Jia Dyi:Who matters upon the ladder of escalation? 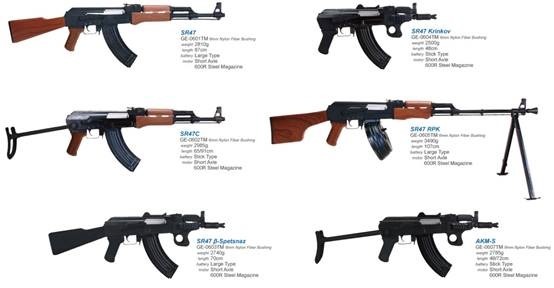 As an air-soft gun manufacturer, SRC used to develop a full-line strategy to use all means to differentiate its AR/AK AEGs in market. They aimed to directly appeal to the final consumers. Let me target a specific category to brief for you. Repair and maintenance business had been always a profiting pillar of Airsoft store, we bring you the most two significant upgrade parts from two brands to satisfy the RM need. They worth your investment! The settings of Novice SR47 match its name with affordable prices- full metal parts in receiver, outer barrel, 600rds magazine and exterior small parts, except plastic grip, stock, and handguard. Basically, SR47 TM series are regarded as metal versions of Tokyo Marui, owning all the same characteristics in original gearbox. SRC also provides upgrade choices for the convenience of customers. SR47 TMII series owns 6mm metal bushing, steel gear set, real wood grip and handguard. SR47 TMIII is its upmost grade, M120 setting in gear box, not only equipped with 8mm metal ball bushing, but also own steel outer barrel. 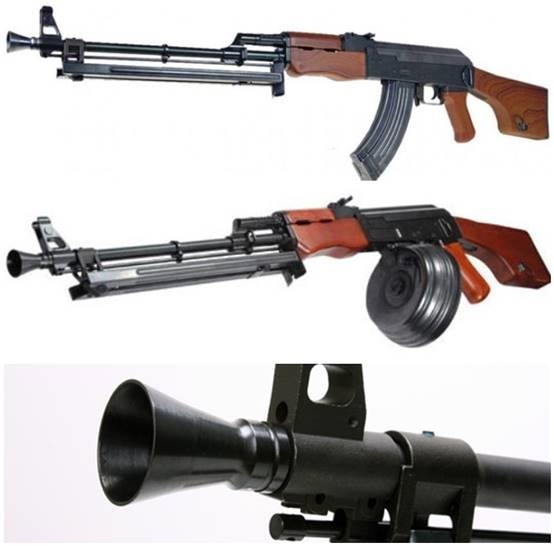 Take SRC RPK for example, real wood version TMII and TMIII both attached 3000rds steel-stamped electric BB drum along with a traditional 600rds magazine. For those who only admire the full steel version without any compromise, we also provide LCT. 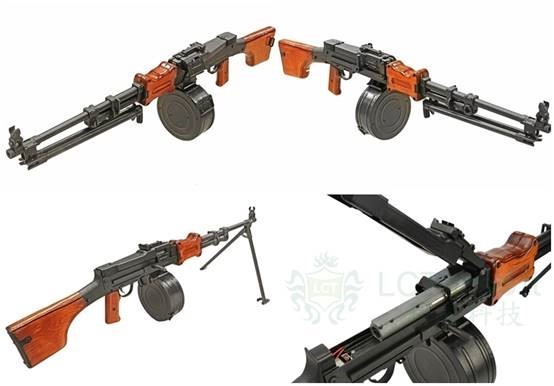 RPD is made up of all steel-stamped parts, CNC-machined HOPUP set, steel cut gear set in 9mm ball-bearing box which owns fast-replacing spring design, 23000rpm motor with mos-FET, BBs spit from 515mm length inner barrel simply make LCT RPD not only a perfect replica to the classic gun, but also a “lawn mower”. AIMTOP had been used to provide a wonderful solution to meet the need for modification in aftermarket. Its tilt-shaped magnetic plates provide the most area to generate the powerful electromagnetic effect. 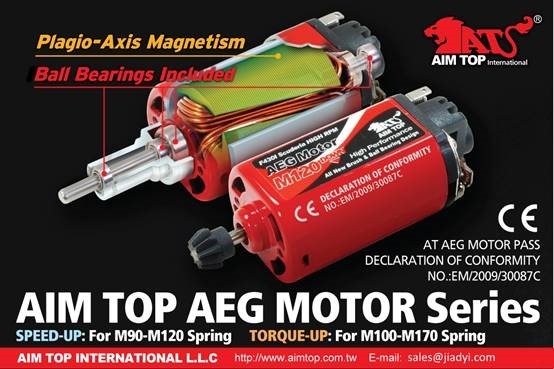 Right match in diameter and length of copper wire on axis along with ball-bearings at two ends, AIMTOP motor unleashes astonishing power at the moment of triggering. 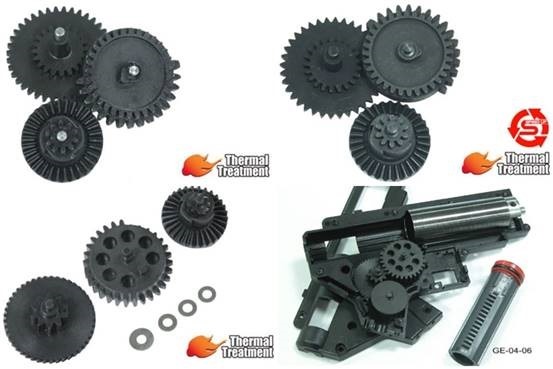 Guarder Thermal Treatment Reinforced Steel Standard Gear Set【GE-02-01】/ Infinite Torque-up Gear Set【GE-02-05】/High Speed Gear Set【GE-02-06】for TM AEG II/III. When talking about AEG spare parts, the Guarder has long been regarded as an industrial standard. Whether it was for common replacement, like standard gear ratio in upper left side, 【GE-02-01】; an ROF orientation in upper right side, 【GE-02-06】;or a high muzzle velocity consideration in left down side,【GE-02-05】. Guarder’s quality earns it fame as if it guards your gearbox till the last round of shot. Kindly note for infinite torque gear set, consumer must use half-teeth reinforced piston,【GE-04-06】,in case the sector gear will interference with piston. Jia Dyi carries not only the wide brand selections but also the match suggestions in aftermarket. Once a newcomer begins his life-time consumption cycle in your shop, how to make a quick and effective recommendation and hit bull’s eyes within his budget? Call Jia Dyi today at sales@jiadyi.com to see what we can offer you.